Many economists and commentators are focussed on the ongoing debt crises affecting the USA, UK, Europe, Japan, and indeed, virtually the entire globe. But David Bloom of HSBC Foreign Exchange suggests that there is “a bigger Armageddon out there”. And the latest RBA data shows that our banks are racing headlong into it. Investors are afraid of “Armageddon” in foreign exchange markets due to concerns beyond the Greek debt crisis and sluggish US growth, David Bloom global head of foreign exchange at HSBC told CNBC Thursday. Bloom described the Greek sovereign debt crisis as “yesterday’s news” for foreign exchange markets, adding fresh worries were spooking investors following Federal Reserve chairman Ben Bernanke’s downgrade of US economic growth prospects for the year and his silence over further fiscal stimulus measures. “Today’s news is will (the US) do (Quantitative Easing) and then is the UK falling apart? This is the problem that we’ve got… this is the problem that I’ve got with currencies, there’s no doubt about it that (the euro zone) is trying to cause a delay and people honestly believe in their hearts that at some stage they’re going to have to take a haircut on Greece, but is there a bigger Armageddon out there?” Bloom asked. He added that in addition to persistent worries over the Greek crisis and the US economy, China was a fresh cause for concern. “We’ve got the possibility of QE in the UK, there’s massive change in growth numbers in the US and now people are starting to worry about China,” he explained. “You saw PMI numbers showing some weakness and actually Chinese interbank interest rates are going up quite substantially, so people are starting to get quite worried,” he added. An “Armageddon” in foreign exchange markets – indeed, even just a serious bout of volatility – would spell doom for Australia’s banking system. And in turn, for our economy, given that our Government has guaranteed our banks using taxpayers future earnings as collateral. There are a number of reasons why a forex “Armageddon” poses a critical threat to our banks. Perhaps the primary one, is their staggeringly large exposure to Foreign Exchange and Interest Rate derivatives. Back in 2003, the world’s most well-known investor, Warren Buffet, famously called derivatives “a mega-catastrophic risk”, “financial weapons of mass destruction”, and a “time bomb”. In essence, the type of derivatives held Off-Balance Sheet by our banks, are financial instruments used for “hedging” and betting on the direction of Interest rates, and Foreign Exchange rates. A large or unanticipated change in those rates, and our banks stand to lose. 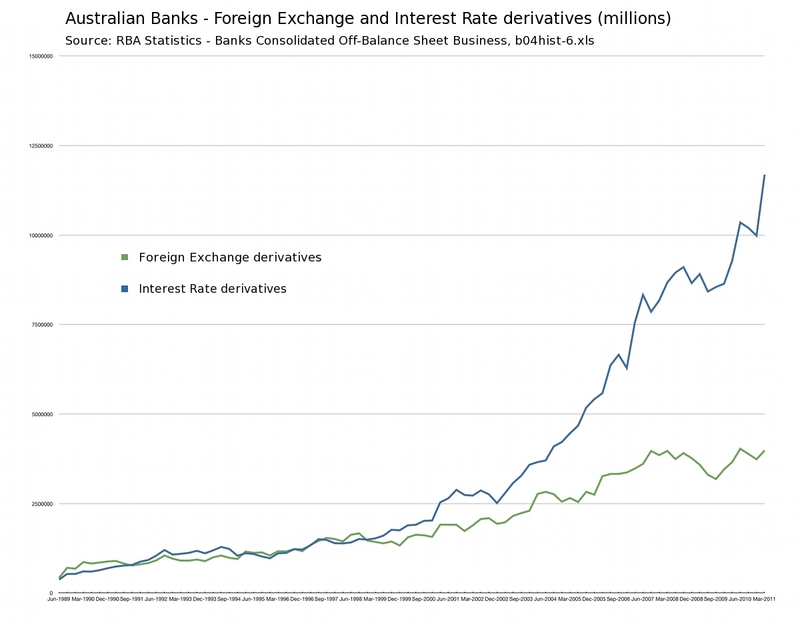 According to the RBA, our banks hold a combined $3.98 Trillion in Foreign Exchange derivatives. And a whopping $11.68 Trillion in Interest Rate derivatives. 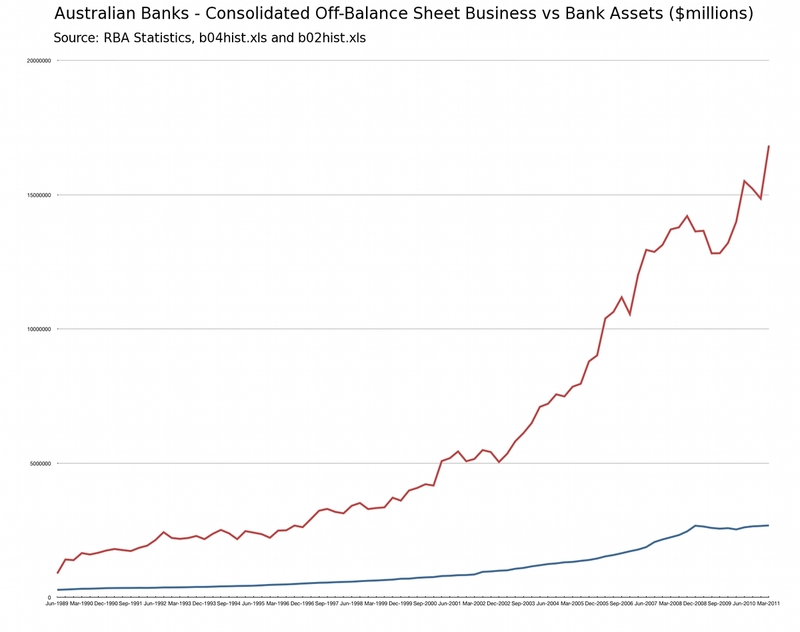 In May ( “Tick Tick Tick – Aussie Banks’ $15 Trillion Time Bomb” ) we saw that Australia’s banks held almost $15 Trillion in Off-Balance Sheet “Business” (mostly derivatives) at December 2010. The latest RBA figures are out, current to March 2011. In just 3 months from December to March, our banks’ exposure to Off-Balance Sheet derivatives “Business” has blown out by a whopping $1.99 Trillion, to a new all-time record total of $16.83 Trillion. That’s the biggest 3-month increase in our banks’ history. You may be wondering how the banks could possibly manage to increase their “Assets” by $19.9 Billion in just 3 months. The answer? 96.4% of that increase ($19.19 Billion) is in new Residential loans. That’s right – your loan is considered the bank’s “Asset”. Which really means, you are their asset. Your signature on that loan document means they literally “own” you, your daily sweat and toil, for the next 30 years. Now, does this suggest to you that our banks are becoming even more reckless? That near-parabolic rise in the chart of their derivatives exposure is approaching what looks just like the classic “blow off” phase of every trading bubble. Certainly there is clear evidence of their becoming even more reckless when it comes to mortgage lending standards. We saw this in data released just a couple of weeks ago – “Fresh Evidence Our Banks In ‘Race To The Bottom’ Means You Can Kiss Your Super Goodbye” (a must-read). This is a classic sign of the near-end of a Ponzi scheme, a sign that was also seen near the end of the real estate bubbles that blew up in the USA, UK, Ireland, and Europe. The last mad rush by greedy banksters to rake in profits, before the bubble bursts. And their losses are “socialised” by the government, on to the backs of the next X generations of taxpayers. Now that we have learned that “Our Banking System Operates With Zero Reserves”, that Fitch Ratings considers “Australian Banks Most Vulnerable To Europe’s Debt Crisis”, and that our banks have just taken on an all-time record $1.99 Trillion in additional derivatives exposure in just 3 months, this new warning about “a bigger Armageddon” in foreign exchange markets should be considered another clear harbinger of an epic disaster to come Down Under.